taking a stand for the brand. Support starts at the top. Can big, trillion-dollar national banks genuinely and authentically share stories of how they help make a difference in the world? Are they able to change business operations from a transactional, product-focused model to making the best decisions based on a holistic and beneficial view of each individual? Or, will it all be seen as a PR move to counter scandal and bad press? Bank of America at least thinks they can. Last November, BofA rolled out a refreshed logo and new brand position, “What would you like the power to do?” Sounds like another national bank (hello, Wells Fargo). We all know Wells had to, and was, doing damage control when they released their refreshed logo and new tagline, “Established 1852. Re-established 2018.” that followed their apology campaign, “Building a Better Bank.” But BofA rebounded after the 2008 financial crisis and didn’t have the series of scandals that seemed to follow Wells Fargo everywhere they went. So, when I saw the commercial that introduced the new logo and brand position (https://youtu.be/PcYtVtylCBE), I had to ask myself – why now? Turns out, BofA has been rebuilding from top-to-bottom behind the scenes since 2015. As an organization, they have really bought into the mission to "respect the power of consumers" and help consumers achieve their goals. It is the core of their new brand positioning and company as a whole. What I find most remarkable is that it truly isn’t about products or fees, but all about what people want in life (experiences, aspirations, wishes, goals). They are actually asking the question, “What would you like the power to do?” and listening to the answers. They are starting a conversation, being thought-provocative and aspirational. It is a direct reflection of the internal changes happening within BofA that the public hadn’t yet been introduced to. 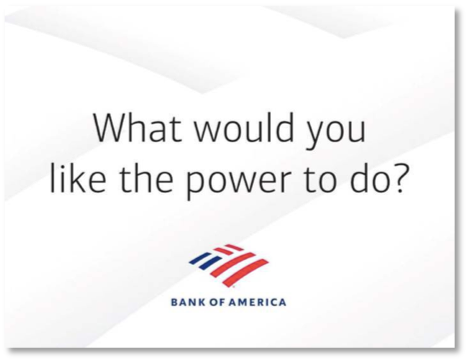 Their “what would you like the power to do?” question goes even further by positioning BofA to tackle big issues – economical, environmental and social. They are starting to be more expressive about the impact they are making as an organization and purposely choosing partners who are making a difference in the world — dealing with the big, messy, important problems that are hard to solve. BofA isn’t just putting their money where their mouth is, but they’re telling stories about the positive impacts a company of BofA’s size and scale can accomplish when put to work. From partnering with Tory Burch, who I have admired for years (founder the Tory Burch Foundation), and creating the Tory Burch Capital Foundation which supports capital to women-owned businesses to support economic independence and job growth, to working with Matt Damon and Water.Org (which Damon co-founded) to support the access of clean water and sanitation in India and Brazil, BofA isn’t just throwing money at philanthropic causes. They are thoughtfully developing long-time partnerships with organizations that align with one of their driving principles, sustainable growth. BofA is dropping the curtain and showing how they are helping find solutions and making a positive impact with numerous long-standing partners. For example, they’ve partnered with The Special Olympics for over 30 years, going beyond funding and keeping inclusion at the forefront of their business operations by hiring hundreds of people with intellectual disabilities. By kicking off the multi-phase campaign with a commercial that features the CEO, a guy who has been described as low-key and quiet, they are making a bold move. The CEO is declaring BofA’s commitment, not just to their 67 million U.S. customers, but also to the world, allowing anyone and everyone to hold them accountable. If you are going to take a stand with your brand position and hold to it, this is the way to do it. It starts at the top of the organization and moves through the entire culture. BofA is embracing how they are helping individuals meet their goals and how they are creating a difference in the world through various organizations. 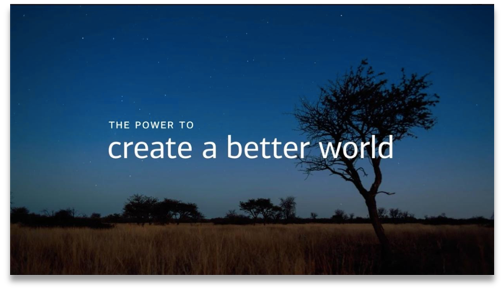 Big or small, environmental or social – BofA wants to know, “What do you want the power to do?” and they’re listening, creating solutions and telling the stories to shine a light on how BofA actually wants to (and is) making a positive impact on the world. Bank of America: The power to change the way trillion-dollar corporations operate and market themselves.